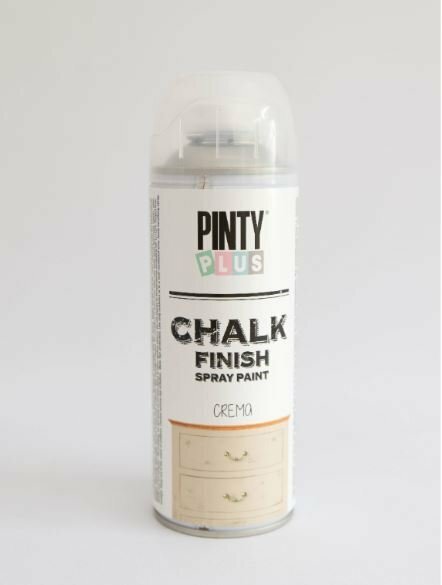 Ever wondered how to get that lovely chalky finish on your furniture and other interior decorative items? It provides an ultra-matt finish with a velvety appearance to give you the softened, vintage touch you desire. This fast drying, water-based formulation is environmentally respectful and offers maximum coverage on many surfaces. Available in 19 beautiful colours, so there is sure to be the perfect shade to compliment your interior. Polystyrene (as it does not contain aggressive solvents, it does not attack the expanded polystyrene). * Please note the London Grey has a green bias when compared to the Ash Grey. Drying: surface 20 minutes, a total of 1 hour. Repainted: with the same paint after 1 hour or a different paint after 24 hours. 1. Please ensure that the surface is clean, dry and free of any contaminants before application. Shake the can vigorously for 1 minute. 2. Spray from a distance of 25-30 cm, applying thin and quick layers, first horizontally and then vertically. It is advisable to spray two thin layers instead of one thick layer in order to obtain uniform coverage and avoid paint runs. 3. Once the operation is completed invert the can and push the nozzle until only gas comes out in order to avoid blockage of the nozzle. Do not use on devices connected to the power grid and store in ventilated areas. In order to achieve a smooth finish surface, it is recommended to apply several thin layers, letting them dry and sanding them lightly until you obtain the desired texture. If you would like to protect the surface with a varnish, we would recommend the water-based varnish, either from our PINTYPLUS AQUA or PINTYPLUS ART & CRAFT range. When applied on plastic surfaces, we recommend to add a layer of our plastic primer PINTYPLUS- TECH in order to obtain the best finish. It can be washed with soap and water within the first 15 minutes.